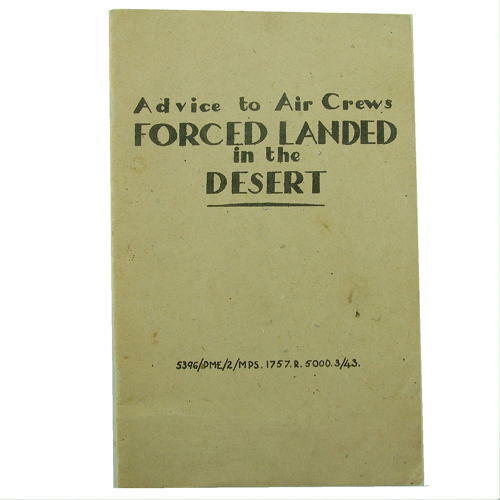 'Advice to Air Crews Forced Landed in the Desert'. Approximately 10 x 15.5cm. 15p. March 1943. Official issue booklet giving basic advice for crews foced landed in operational areas where escape is desirable. Key points cover resting, appointing a leader, checking of kit (rations,flares first aid), water rations & collecting water, travel at night, taking your time, looking after the feet, signalling to aircraft and so on. Great little publication, rarely seen. Stock code PNIV.